WARNING: A tube amplifier chassis contains lethal high voltage even when unplugged--sometimes over 700 volts AC and 500 volts DC. If you have not been trained to work with high voltage then have an amp technician service your amp. Never touch the amplifier chassis with one hand while probing with the other hand because a lethal shock can run between your arms and stop your heart. Use just one hand when working on a powered amp. The above warning is a pretty standard warning for high voltage work. An electrified tube amplifier chassis has many hazards that will bite you if you work on them long enough. 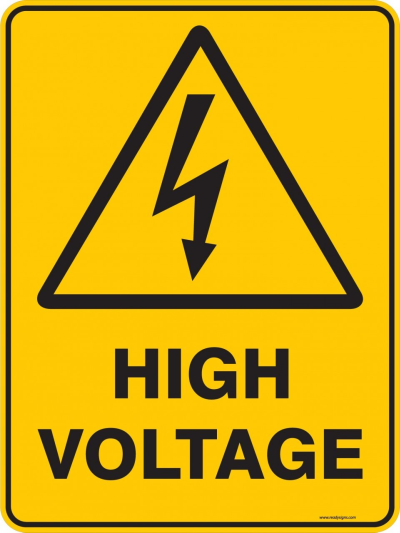 Ask any amp tech about his adventures with high voltage and you'll get some interesting stories. 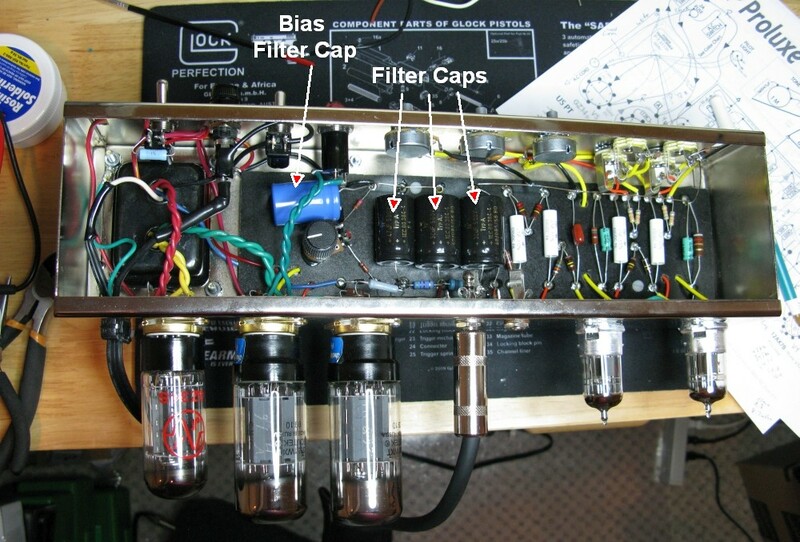 The info on this page is meant as a warning to the many hazards inside a tube amplifier. In the USA there is mains voltage on the power switch & fuse at 125 volts and 15 amps (up to 250v in other countries). The power transformer high voltage secondary puts out up to 900 volts AC. The DC power supply can generate up to 500 volts DC. The filter caps can store that 500 volts DC for days at a time, even when the amp is unplugged. Don't forget to unplug the amplifier unless you need it powered. Forgetting to unplug the amp and making contact with the ALWAYS HOT POWER SWITCH OR FUSE TERMINALS is the number one cause of amplifier shock. Yes, the power switch and fuse terminals are hot even with the Power Switch in the OFF position. Do as much work as possible with the amp unplugged and the filter caps drained (see below). Use one hand to work on a powered amp chassis. Put one hand in your pocket. Seriously. An amplifier metal chassis is a near perfect ground. If one hand is touching the chassis when the other hand encounters high voltage the current will travel up your arm and across your chest and can easily stop your heart. Don't hold or touch a guitar either because if it's plugged in to any amp the guitar will be an excellent ground. Use a clip-on ground probe for your multimeter so you can use just one hand to take measurements. Always be aware of the position of the always hot power and standby switch terminals. They are often placed near the chassis edge and are easy to make contact with when resting a hand on the chassis. Even with the power off the fuse holder and power switch terminals are hot. Wear safety glasses when working in an amp chassis. If you short a high voltage component to ground an electrical arc can spew molten metal into your eyes. If you wear prescription glasses or need readers then get some clip on side guards to help protect your eyes. Consider wearing high voltage protection electrical gloves. I tried a pair of these but they were too bulky for me and made handling the meter probes difficult but if you want to be as safe as possible these can keep you from getting bit. Just wearing one glove on your non-dominant hand can prevent a hand-to-hand shock that can stop your heart. At $17 they are a pretty good investment. Wear rubber soled shoes or sneakers when working on an amp to increase the insulation between your feet and the ground. Remove rings, wristwatches and other jewelry when working on an amp. You don't want your wedding ring to bridge a hot pin to the chassis. Don't assume a circuit breaker will protect you from an amp shock. Because of the very high voltage in an amp very little current is needed to stop your heart. Just a few milliamps of high voltage DC can do it. Try not to work alone. If an electrical shock incapacitates you having someone available to call 911 can be a lifesaver. When using a multimeter in a hot chassis be very careful not to touch two tube pins with one probe which will short the pins together. Fireworks can ensue. Cover your multimeter probes except the very tip with shrink tubing to prevent accidental contact and shorting. It is often safer and easier to take a reading on the circuit board instead of at the tube socket pin, just follow the wire connected to the pin to the circuit board and measure there. Stop working when you get tired. It's too easy to make a dangerous mistake when you're fatigued. When you return to your bench after a break always verify the filter caps are discharged. Don't assume caps are still drained because capacitors can self charge due to dielectric memory. When measuring current (milliamps) as soon as either meter probe makes contact with a voltage, that same voltage passes through the meter to the other probe--both meter probes will be hot with high voltage so you must control both probes carefully, when placing and removing the probes. You must wear safety glasses because if a meter probe accidentally contacts the chassis or a grounded component an arc will occur and molten metal will spray out from the arc (don't ask me how I know). Use a ground fault interrupt (GFI or GFCI) cord or socket with the amps on your bench. Using one on the road is also a good idea for gigging musicians. 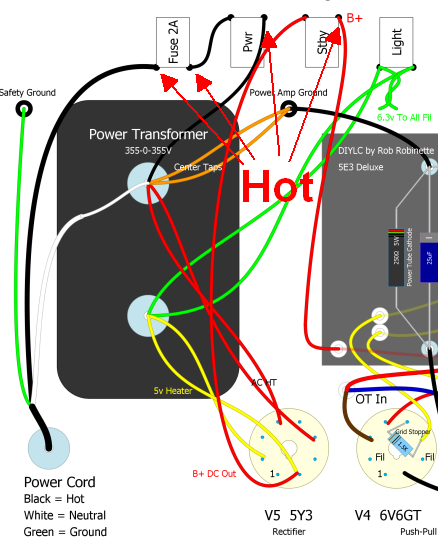 If the GFI senses any current flowing through the safety ground it will disconnect the power from the amp so a loose hot wire in the chassis will trip the GFI and prevent a serious shock. You must fight complacency. As you gain experience working on live amp chassis you may begin to feel comfortable--this should cause the hairs on the back of your neck to stand up. You must stay aware and focused when doing any hot amplifier work. Always inspect the amp chassis for leftover tools, parts and hardware before powering it up after a repair. Carefully inspect the amp to make sure you didn't bend terminals or leads into contact with other parts. I like to use a light bulb current limiter to power up an unfamiliar or new build amp. The filter capacitors in an amp store enough high voltage DC to kill you, even when the amplifier is unplugged so you must check them for residual DC voltage and drain them if voltage above 30 volts DC is detected. Capacitors can hold their charge for days. Filter capacitors are not always grouped at the power transformer end of the amp chassis. They can be placed anywhere on the circuit board. This is a 5E3 Deluxe with fixed bias so it has a bias filter cap (big blue cap above). Many amps like the Fender blackface and silver face amps have their filter caps located in a "doghouse" or metal covered area outside the chassis near the transformers. Some amps use "cap cans" which are large multi-capacitor cans secured to the chassis by clamps. Many, but not all amps will drain their filter capacitors if you leave the standby switch on (amp in playing mode) and turn the amp power switch off. The tube circuits will use up the stored energy in the caps and if you play the amp as you unplug it you'll hear the volume drop off as the caps drain. Unplug the power cord immediately so you won't forget to do it. Some amps have filter cap drain resistors in parallel with the filter caps to automatically drain them when the amp is powered down. But even if the amp you are working with has cap drain resistors you must verify ALL the amp's filter capacitors are discharged before going inside an amp chassis. Use your multimeter to measure the DC voltage across the caps. You must check all the caps because many amps put some of the caps on the hot side of the standby switch so they can be isolated from the rest of the circuit and hold their charge. Be very careful when powering up an amp without the tubes installed. Without the tubes to use up the stored capacitor voltage the circuit can hold higher than normal voltage for several days. I got bit by an amp because I expected it to self discharge like it always did before. You can build a capacitor discharge probe to safely drain the caps' current to ground. The probe uses a resistor to control the current flow from the cap to ground. Clip the probe's ground wire to the chassis or ground point and touch the probe tip to the filter caps' positive terminal to drain the stored current to ground. It may take up to a minute to drain the current to a safe level of less than 30 volts DC. Some people leave their drain probes connected during their work but too many have accidentally left them in the amp during power up. If you plan to leave the probe connected put some colorful tape on it to make it more visible. Another cap drain technique is to short the cold side of a plate load resistor to ground. In the 5E3 layout above the 100K plate load resistors are highlighted at lower right. The "cold side" of the plate load resistor is the tube end of the resistor. Short that end of the resistor to ground and the caps' current will flow through the plate load resistor to ground in a controlled manner. Do not short the filter caps directly to ground. An electrical arc may form and spew molten metal--this is why you should always wear safety glasses when draining caps. You can also damage the capacitors by grounding them. WARNING: After draining the caps you must verify ALL of the filter caps have less than 30 volts DC remaining.